Government Overseas territory of the U.K.
Overseas territory of the U.K. 1.) Abandoned in 1997 gov't buildings currently at Brades; making it the de facto capital. 2.) An estimated 8,000 refugees left the island following the resumption of volcanic activity in July 1995; some have returned. Montserrat is a lush, mountainous island in the Caribbean Sea, located in the Leeward Islands, part of the chain of islands called the Lesser Antilles. It measures approximately 16 km (10 miles) long and 11 km (7 miles) wide, giving 40km of coastline. Montserrat was given its name by Christopher Columbus on his second voyage to the New World in 1493, after its namesake located in Catalonia, Spain. Montserrat is often referred to as the Emerald Island of the Caribbean, due both to its resemblance to coastal Ireland and to the Irish descent of most of its early European settlers. Montserrat is an overseas territory of the United Kingdom. Its official name is the Crown Colony of Montserrat. 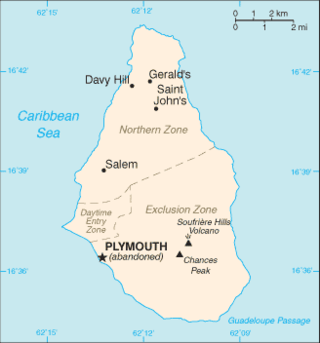 Its Georgian-era capital city of Plymouth was destroyed and two-thirds of the island's population forced to flee abroad owing to the eruption of the Soufriere Hills volcano that began on July 18, 1995. The eruption continues today on a much reduced scale, the damage being confined to the areas around Plymouth including its docking facilities and the former W.H. Bramble Airport. An exclusion zone, open during the day, extends from the south coast of the island north to parts of the Belham Valley and provides visitors with a spectacular view of the volcano and the destruction it has wrought upon the town. A new airport at Geralds in the northern part of the island opened in 2005. Montserrat was populated by Arawak and Carib peoples when it was claimed by Christopher Columbus on his second voyage for Spain in 1493, naming the island 'Santa María de Montserrat'. The island fell under English control in 1632 when a group of Irish fleeing anti- Roman Catholic sentiment in Saint Kitts and Nevis were forcibly settled there. The import of slaves, common to most Caribbean islands, mainly coming from West Africa, followed during the 17th and 18th centuries and an economy based on sugar, rum, arrowroot and Sea Island cotton was established. In 1782, during the American Revolutionary War, Montserrat was briefly captured by France. It was returned to the United Kingdom under the Treaty of Versailles which ended that conflict. From 1871 to 1958 it was administered as part of the Federal Colony of the Leeward Islands, and then it became a province of the short-lived West Indies Federation from 1958 to 1962. With the advent of Beatles producer George Martin’s AIR Studios Montserrat in the 1970s, the island attracted world-famous musicians who came to record in the peace and quiet and lush tropical surroundings of Montserrat. The last ten years of the twentieth century, however, brought two events which devastated the island. In September 1989, Hurricane Hugo struck Montserrat with full force, damaging over 90 percent of the structures on the island. AIR Studios closed, and the tourist trade upon which the island depended was nearly wiped out. Within a few years, however, the island had recovered considerably – only to be struck again by disaster. In July 1995, Montserrat's Soufriere Hills volcano, dormant throughout recorded history, rumbled to life and began an eruption which eventually buried the island's capital, Plymouth, in more than 40 feet (12 m) of mud, destroyed its airport and docking facilities, and rendered the southern half of the island uninhabitable, forcing more than half of the population to flee the island owing to lack of housing. After a period of regular eruptive events during the late 1990s including one on June 25, 1997 in which 19 people lost their lives, the volcano's activity in recent years has been confined mostly to infrequent ventings of ash into the uninhabited areas in the south, although the nuisance occasionally extends into the populated areas of the northern and western parts of the island, for instance the May 20, 2006 collapse of a lava dome that had been slowly building resulted in an ashfall of about an inch (2.5 cm) in Old Towne and parts of Olveston. There were no injuries or significant property damage, and the last such incident had been nearly three years before. Montserrat today remains lush and green. A new airport, opened officially by the Princess Royal Princess Anne in February 2005, received its first commercial flights on July 11, 2005, and docking facilities are in place at Little Bay where a new capital is being constructed out of reach of any further volcanic activity. Montserrat is a British overseas territory (formerly a crown colony). The monarch, Elizabeth II, is represented by the Governor, Deborah Barnes-Jones. The United Nations Committee on Decolonization includes Montserrat on the United Nations list of Non-Self-Governing Territories. The current Chief Minister of the island is Lowell Lewis, of the Montserrat Democratic Party, replacing the outgoing Chief Minister, John Osborne of the New People's Liberation Party. The New People's Liberation Party, after losing its majority in the Legislative Council of Montserrat because of its poor showing in the 2006 election, supported Lewis for Chief Minister. Moves towards full independence have been effectively halted by the volcano and the consequent evacuation. Montserrat is a full and participating member of the Caribbean Community (CARICOM) and the Organisation of Eastern Caribbean States (OECS). American University of the Caribbean School of Medicine (AUC) was founded in Montserrat in 1978. With the aid of the government, a medical campus was built on a 25-acre site. After the eruption of the Soufriere Hills volcano in 1995, AUC moved its facilities to its present location on St. Maarten. The University of the West Indies also offers courses on the island. The island of Montserrat is located approximately 480 km (300 miles) East-Southeast of Puerto Rico and 48 km (30 miles) Southwest of Antigua. It comprises only 104 km² (40 square miles) and is increasing gradually due to volcanic deposits on the southeast coast of the island), 16 km (10 miles) long and 11 km (7 miles) wide, with dramatic rock faced cliffs rising 15 to 30 m (50-100 feet) above the sea and smooth bottomed sandy beaches scattered among coves on the west side of the island. Montserrat has been a quiet haven of extraordinary scenic beauty and near perfect climate to the mainly Canadian, British and US expatriates who sought privacy in its cliffside villas and estates. Montserrat has only two islets: Little Redonda and Virgin. It was formerly the home of a branch of George Martin's AIR Studios (and other amenities) that made the island popular with working and vacationing musicians and other celebrities. Alphonsus “Arrow” Cassell MBE born in Montserrat is most well known for his Soca song "hot hot hot". The song is very well known all over the world and has sold over 4 million copies. Currently, American middle school students are eligible to participate in an Operation Montserrat live simulation. This is a videoconference program based on events of 1996 in which a hurricane approaches and a volcanic eruption occur nearly at the same time. The students are responsible for rescuing all of the people. In the weeks leading up to this, they practice the skills they need in their classroom.